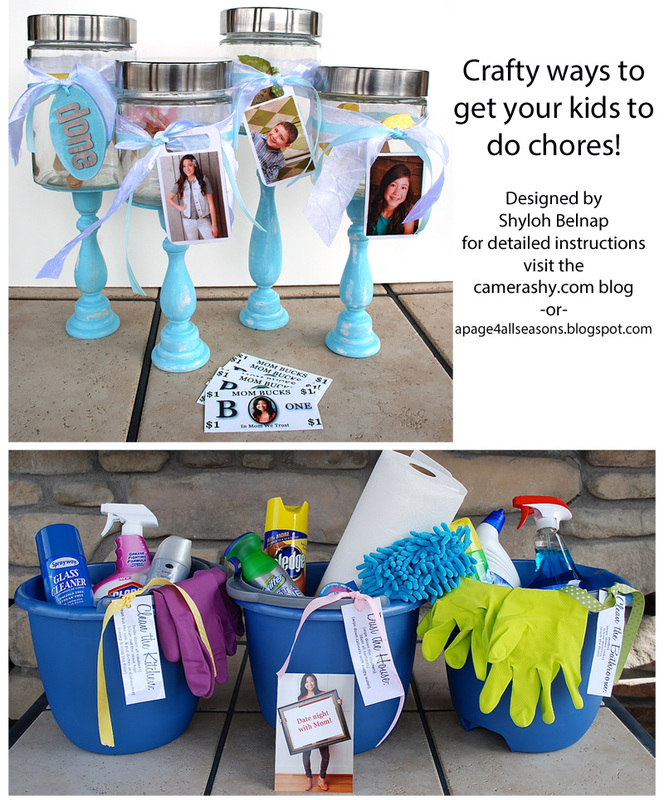 Shyloh Belnap: Good Things Utah segment featuring CAMERA SHY PICS...Crafty ways to get your kids to do chores! Good Things Utah segment featuring CAMERA SHY PICS...Crafty ways to get your kids to do chores! With spring in the air I am REALLY feeling the need to clean my house! I am quickly realizing I need my kids' help to do this so I created a few ideas to help get things done. I saw this idea on Pinterest and I would LOVE to give credit for this cute idea but there was only a picture, and not a link anywhere! Since I have 3 kids I got 3 buckets with the supplies needed for them to do their chores. I put a tag on the bucket with their "to do list". When they finish this chore, I am going to let them draw a lottery ticket! This lottery ticket is where I got my craft on! I went to CAMERA SHY IN LEHI and told them I needed a decent picture of myself (hard to do!) holding a frame. It was easy because they have so many props they grabbed this frame right away! They snapped me some pics and I picked my favorite one. Because they give me the CD of pictures, I was able to use photoshop and add a white square inside the frame and then just simply print these puppies at Costco. With a thin sharpie marker I wrote in the "prize" they will get for completing their chore. Using 2 parts metallic paint to 1 part dish soap, paint a square of paint on a piece of contact paper or clear tape. Let dry and re-paint as needed for coverage. Cut the contact paper to the size of the square on your picture. Now it is ready to be scratched off! 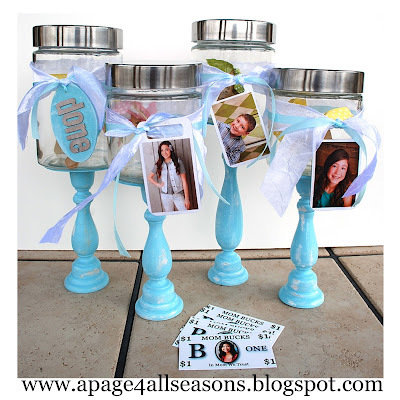 I love this idea because I can make their chores match my room and look like decor! To start, I will give you instructions on how to make this cute little puppies and then I will tell you how I use them! I wanted the color on my candlesticks to show through as being white so I painted each wooden candlestick with a coat of white paint first. I then applied Aquaphore (but I think you can also use vaseline) to the areas I wanted to have the white show through. Paint the top coat you would like. I used blue paint. Sand the Candlestick with sand paper and the white will show through effortlessly. 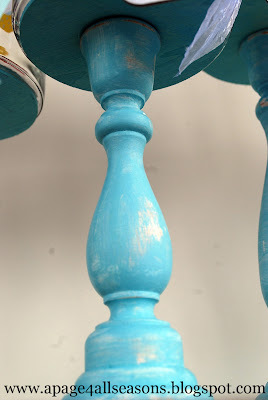 LOVE easy distressing! Glue a wooden 4” disk (painted blue) to the top of your candlestick. 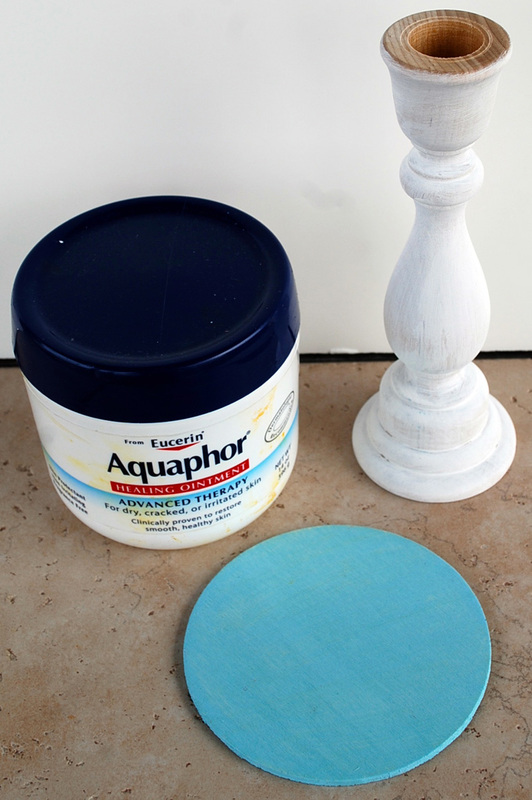 Glue the glass jar to the top of the wooden disk. I used E6000 glue. I then tied ribbons and a tag with a picture of my kids (love that I can print Camera Shy pictures to any size) to each jar. One jar got a tag that simply says “done”. 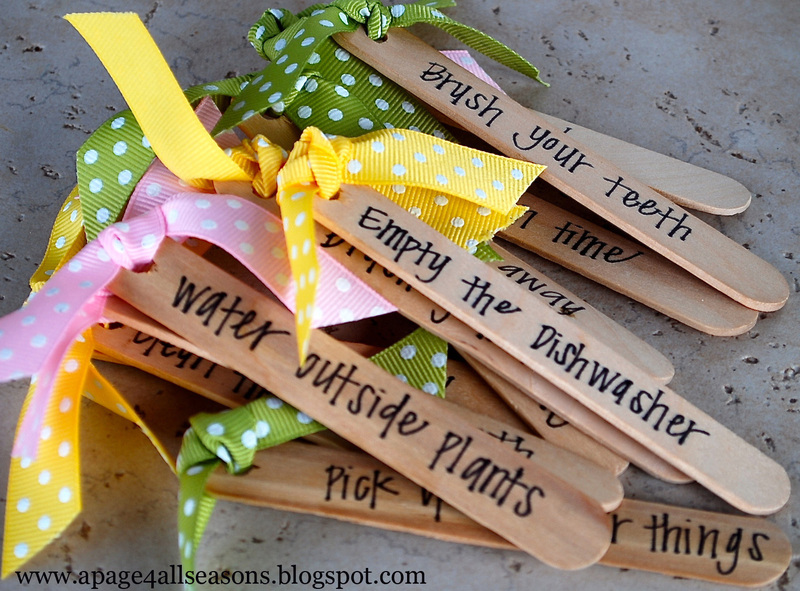 Next I got some popsicle sticks from the craft store and wrote the chores I wanted each kid to do on the stick. I used my crop-a-dile hole punch to punch a hole and tie a ribbon on the top of each stick. Each stick has a different color of ribbon for each child. 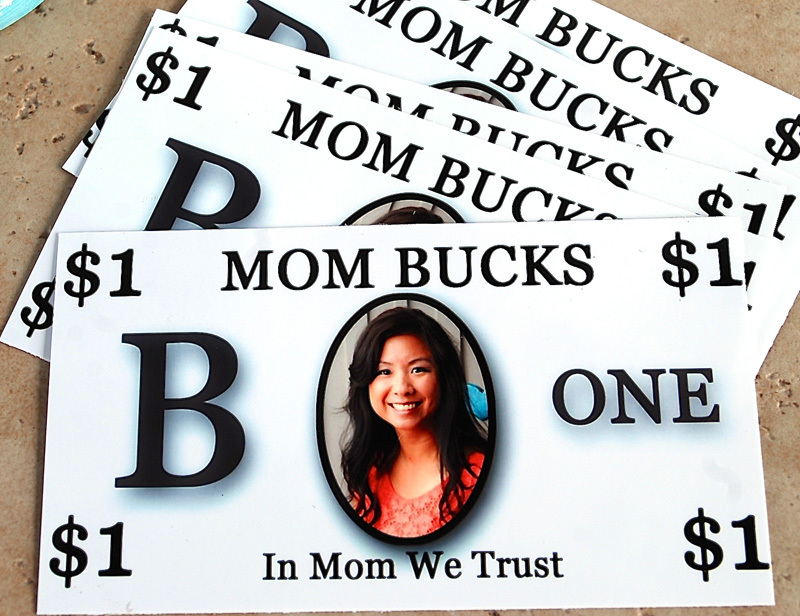 I used one of my pictures from Camera Shy to make these "Mom Bucks" on my computer. Now, are you wondering what to do with all this? It is simple! I just put the sticks in each jar for each child at the beginning of the day. When they have completed their chore, they will get to put that popsicle stick in the "done" jar. At the end of the day I pay each child by putting their mom bucks in their jar. They can cash them in at the end of the week. 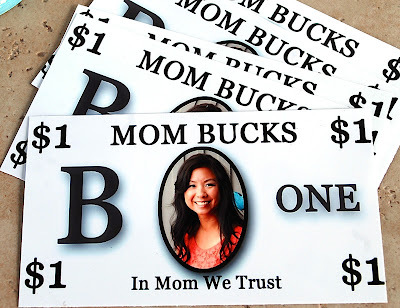 I like using mom bucks so kids don't lose the money throughout the week, but they get to see it add up as they do their chores. What a phenomenal idea! Wish I could have done it when my kids were little. I have one in college, and one about to leave for college in a few weeks. Maybe I can do it for the grand kids!!!! Nah--I get to spoil them, not work them!! !